At Twincraft Skincare, we know bar soap. We’ve been making it since 1972, and we are proud to be the contact manufacturer of choice for any brand that wants to bring superior bar soap to bathrooms nationwide and around the world. At our Winooski, Vermont headquarters, we conceptualize the best bar soap for face and body, and our large team of over 250 employees turns a brand’s vision into a beautiful, high quality final product. For over 45 years, we have led the industry in innovation and sustainability, and prioritize natural developments. Every brand that we work with has their own natural standards, and we are flexible to work with your needs and concerns. Natural colorants, sustainably harvested active ingredients, coconut oil soap base, RSPO certified palm oil soap base, and a solar powered manufacturing facility are all available to our business partners here at Twincraft. At our primary manufacturing facility, we finish bar soap, which means that we purchase soap base from several of the leading soap base providers in the world. We mix in various additives – fragrances, colorants, active ingredients – and refine the ingredients into the base, extruding and pressing the result into finished bar soap. Our process for extruding bar soap is highly efficient and produces consistent bars that last much longer than a poured version. 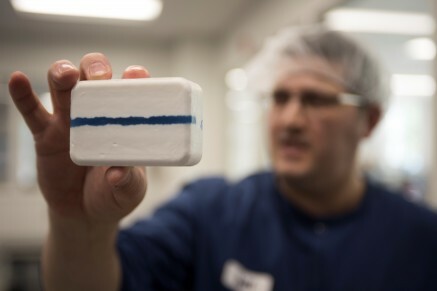 Poured bar soap often has fun visual aesthetics that can’t easily be replicated at our manufacturing scale or with our equipment, but that doesn’t mean that our team isn’t up to a challenge. We are inspired by poured soap trends, and our innovation team is always working to develop new aesthetics. Reach out to our sales team to request a sample of a 2-in-1 bar, moisturizing shave bar, spiralized galaxy bar, glow-in-the-dark bar or many of our other inspired recent creations. How Is Bar Soap Made? Each bar soap that we finish starts at the batching stage. A Batch Maker is responsible for mixing ingredients according to our lab’s formulation specs. Soap pellets are weighed according to a batch sheet and dispensed into a large mixer. Any dyes or titanium dioxide is also added to the batch, and color is tested against an agreed upon standard before adding remaining ingredients. Our bar soaps pass through a process that qualifies them as triple milled, as well as French milled, depending on the marketing claims a brand would like to use. The first refiner extrudes the soap base through a mesh screen to break the batch down into soap ribbons and the second refiner pushes the ribbons through another mesh screen. The soap passes through a vacuum chamber, which pulls air out of the soap to ensure that it is free of air pockets or streaks. In the final extrusion stage, a nose cone heats the outside of the soap slug to make it more pliable and perfect for pressing. An extrusion plate dictates the slug’s shape as it is prepared for the next stage. Soap slugs are cut into a shape that will fit the selected die using a Uni-Cutter. Cut slugs are moved along on a conveyor belt as they prepare for the pressing stage. Bar soaps that are made here at Twincraft are pressed in one of two options: a condor press or an STU press. A condor press compresses two portions of the shape together, resulting in excess soap being squeezed out through a parting line around the perimeter of the bar. All condor pressed bars have parting lines, but they can be a high- or mid-parting line, depending on the die used and the desired final result. Condor presses are highly efficient as excess soap is recycled into the soap extruder and is easily reused to make more bars. An STU press utilizes a soap slug that is cut to just under the length of the desired shape, and pressed in a ring to the weight of the finished soap. STU pressing results in very little excess soap, and will always have a solid band around the perimeter of the bar where it was formed in the ring.